Our consulting & services are integral parts of our clients' sustainable success in Indonesia. 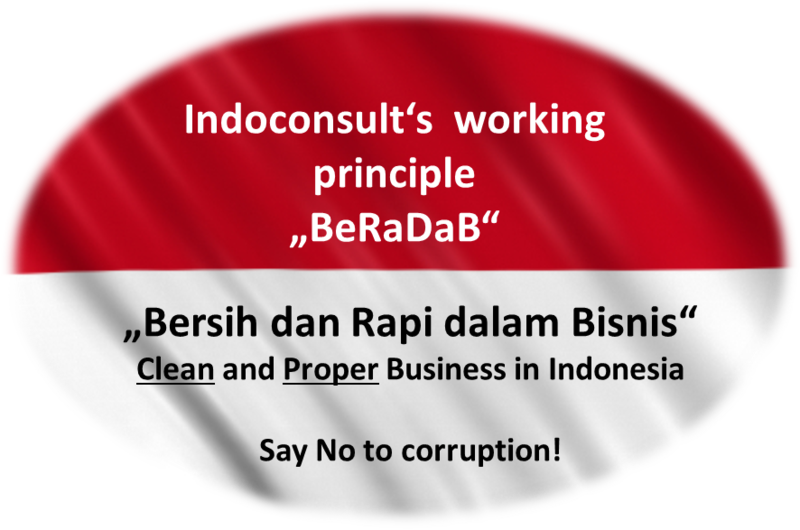 To make this possible, we keep our clients' businesses clean and proper; despite the fact that corruption and nepotism are still issues a foreigner will encounter when doing business in Indonesia. We do our business in accordance with our working principle "BeRaDaB - Bersih dan Rapi dalam Bisnis! ", which means translated "Doing clean and proper business in Indonesia." We do not involve in corruption, nepotism, or collusion - neither with our clients' businesses nor with our own business in Indonesia. We follow the regulations and laws of the countries we work in. We believe that corruption harms business, people, and countries. Even if things might run faster, once you get involved with corruption, no matter how small, your business won't be successful for the long-term. This also means that we do not adapt any doubtful or legal uncertain practices and do not offer solutions, which might be harmful for our clients or to our officers. Practices we explicitly do not support are the so-called "Nominee-Agreements" for company setup, shelf companies, involvement of individuals which are under investigation for criminal acts, models which might be considered as tax evasion, speed-up payments, company structures which do not comply with the investment regulations of the Republic of Indonesia. Sustainable business needs to be clean business - and that is the basis for successful operations in Indonesia.